Indian markets ended sharply higher Monday led by gains in frontline stocks from metals, IT, banks and capital goods space. It was the highest closing for the benchmarks since last October. 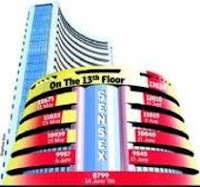 Bombay Stock Exchange’s Sensex closed at 12,113.29, up 710.04 points or 6.23 per cent. The index touched a high of 12161.90 and low of 11635.24. National Stock Exchange’s Nifty ended at 3646.35, up 172.40 points or 4.96 per cent. The broader index touched a high of 3664.50 and low of 3478.70. BSE Midcap Index was up 3.93 per cent and BSE Smallcap Index moved 3.53 per cent higher. Amongst the sectoral indices, BSE Metal Index was up 8.89 per cent, BSE IT Index gained 8.45 per cent and BSE Bankex moved 7.74 per cent higher. BSE Healthcare Index was up 1.53 per cent. Massive gains in Sterlite Industries (16.46%), Hindalco Industries (14.76%), HDFC (13.25%), Mahindra & Mahindra (12.8%) and ICICI Bank (11.08%) drove the indices significantly higher. “Sterlite Industries can hit a target of Rs 650 per share and is advisable to buy this stock on dips. M&M is highly overbought and can face the resistance around Rs 590 levels. It is advisable to hold on to long position, however fresh long position is not advisable on this counter until it surpass Rs 600 levels,” said technical analyst, Praveen Kumar of ULJK Securities. Mahindra & Mahindra reported 14.8 per cent increase in total sales in April 2008 as compared to a year ago period. The auto giant’s domestic sales grew 16 per cent on an annual basis while exports declined 39.3 per cent. The stock ended 2.43 per cent higher at Rs 486.25. There were no losers in the 30-share index. Market breadth on BSE favoured advances throughout the day. Advancing shares numbered 1768 while declines stood at 776. European markets were in the green and US stock futures indicated a positive opening.